If you’ve ever fancied scuba diving at the Great Barrier Reef but can’t afford it, this idea from OVA Studio might provide a solution. The Swimarium is a design concept in which LED screens are placed all around a pool to create an immersive virtual swimming experience that would let you dive anywhere in the world. 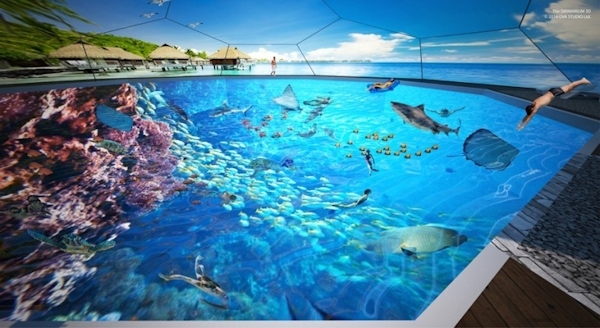 The Swimarium would have each of its sides, its bottom and a ceiling dome all formed of glass with LED screens behind. The screens would be used to show panoramic content from dive sites around the world to give pool users the sense of being there. Video shown could be pre-recorded or, with the right technology, could show live feeds from the chosen sites. OVA suggests that the Swimarium could also be used to show other types of environments, rather than just ocean scenes. One example given is video footage taken from orbiting space-craft or satellites. Users could be given the sense of floating through space at zero gravity. The proposed Swimarium design uses a truncated icosahedron shape, which the firm says gives it an organic feel. The pool is 25 m (82 ft) in diameter and a bar is built into one of the sides so that users can view the content and get a feel for the environment without being in the pool. The dome, meanwhile, is roofed with solar panels that OVA says could provide almost enough energy to power the Swimarium. At present, the Swimarium is only a concept, but Ouahes says OVA is looking for interest from venues such as entertainment parks, swimming pools and diving schools.